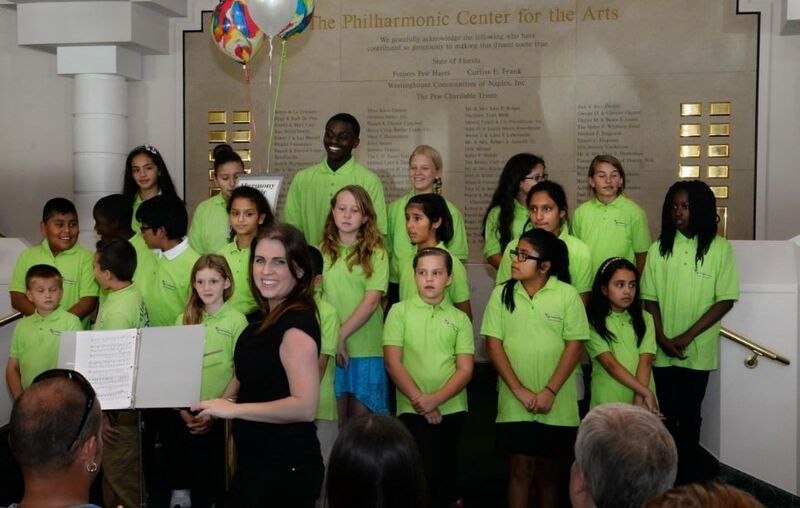 The Gulfshore Opera Harmony Youth Choir program started with only one location in partnership with Artis-Naples. After receiving a grant from the Southwest Florida Community Foundation last year, the program moved from a single location to partnerships with various existing afterschool enrichment programs. The Harmony Choir is a youth development program that seeks to affect social wellbeing through the pursuit of musical excellence. The program is delivered at no cost to participants. Activities include choral singing, musicianship skills and percussion and dance. By March of 2016, there were three chapters offering twice a week Harmony choir classes to over 40 children; Charlotte County at Boys & Girls Club, Lee County at Dunbar Middle School and Collier County at Grace Place. The students performed in the GO production of Bach’s St Matthew Passion along with 130 professionals, college music majors and volunteers. They also participated in Artis-Naples Community Day where after performing their own concert in the lobby of Hayes Hall, they (and their families) got to see the Philharmonic Youth Choral on the big stage and also to visit the art museum. After a summer break, the program is starting up in October with a new administrative director, Kate Peterson, who has years of experience as a school guidance counselor and a new lead music teacher, Lois Carme, who is experienced in dance instruction as well as vocal music. Both ladies are passionate teachers and children’s advocates. This fall the opera welcomes two new partnerships because of relationships established as a member of the Community Foundation grantee Tribe. The opera will team up with Gulfcoast Symphony’s Music Works program at the Heights Center and at PACE Center for Girls in Lee County. The Gulfshore Harmony Choir vision is to provide a loving, creative environment that guides and encourages a diverse group of children, teens and parents to supports one another through the pursuit of musical excellence. It is a long range vision which, over time, is proven to have lasting benefits to participants and the community at large. For more information, please visit www.gulfshoreopera.org.